Martin Shkreli, the biotech bad boy who was indicted for securities fraud on Thursday, has stepped down as CEO of Turing Pharmaceuticals. Turing announced Friday that its chairman Ron Tilles will take over as CEO on an interim basis. Tilles thanked Shkreli in a statement and added that the company wishes him "the best in his future endeavors." Of course, it's highly unclear what those endeavors may be. It's possible that heading to prison will be one of them. It's also not certain what will happen to Turing and the other company that Shkreli ran, a publicly traded firm called KaloBios. Neither are part of the charges against Shkreli. The feds are going after Shkreli for things he allegedly did at Retrophin (RTRX), a biotech he founded in 2011 and was fired from last year. Turing, the privately held firm Shkreli started after being ousted from Retrophin, has been losing lots of money -- $28 million during the first nine months of the year. The company raised $90 million in a round of financing led by Shkreli earlier this year. Turing said "multiple preeminent institutional equity investors" also invested but declined to name any of them. Turing's main drug is Daraprim, the treatment for cancer and AIDS patients that made Shkreli a household name. Turing bought the drug in August and shortly after that, Shkreli announced he was raising the price of the drug by nearly 5,500% -- from $13.50 a pill to $750. But given the backlash against Shkreli and the new criminal charges, it's unclear why hospitals would want to buy Daraparim from Turing -- especially since another company, Imprimis (IMMY), is making a generic alternative that it will sell for only $1 a pill. Before Turing announced Shkreli's resignation. the company said in a statement Thursday that Shkreli's legal matters "are personal and have no bearing" on the company. "We maintain our deep commitment to patients, providers, and the progress of our important R&D pipeline," Turing added. In addition to Daraprim, the company also has a drug to treat high blood pressure and is developing one for mood disorders. But it is curious that Turing casually dismissed Shkreli's charges. The matter may be personal. But Shkreli essentially was Turing. He's put a lot of his own money into the company and led this year's financing round. Will any of the "preeminent" investors Turing cited still want to back the company? And how will Turing attract new investors when it inevitably needs more cash? Shkreli's other company, KaloBios (KBIO), has still not commented on his indictment and arrest. And its future looks decidedly murkier than Turing's. It later said it would wind down its operations, liquidate assets and discontinue the development programs for two cancer drugs -- one for hematologic malignancies and another for chronic myelomonocytic leukemia. KaloBios then quickly signed an agreement to buy another drug -- a treatment called benznidazole for Chagas Disease, a rare infection spread by tropical insects. 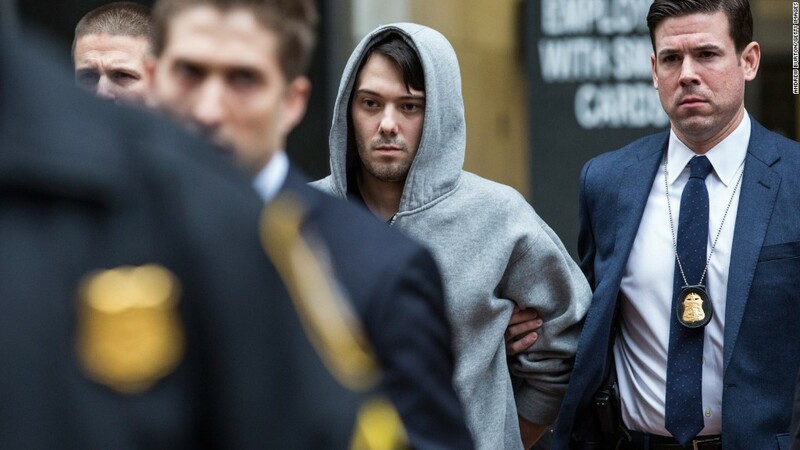 Will the deal go through given Shkreli's legal problems? The seller of the drug -- a privately held firm named Savant Neglected Diseases -- was not immediately available for comment. What's more, many investors were shorting the stock -- betting that it would fall -- before Shkreli took control. Shkreli's moves burned many of those investors. So it seems safe to suggest that many of those short sellers will target KaloBios again -- assuming it resumes trading anytime soon.